Do you work in Business and Executive Coaching? Are you interested in Business and Executive Coaching? Are you ready to invest your time in learning new tools and methodologies for your Business and Executive Coaching practice and help more your clients? If you answer « YES » to one of these questions, it means that this great event WBECS 2016 is for You ! It is totally free of charge ! Amazing ! As a Business and Executive coach, there’s nothing more important than the quality of your Business and Executive coaching provision – which is exactly why I’m writing to you today! Last year, I attended WBECS – the world’s largest online summit for Business and Executive coaches – and I gained heaps of value from all of their powerful sessions. 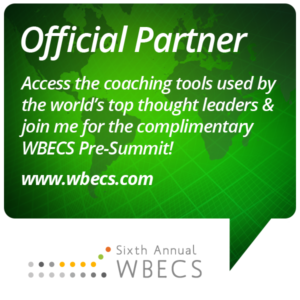 Each year, WBECS brings together the top thought leaders and experts in the profession who share their best coaching frameworks, tools and methodologies with you during their live presentations. The speaker line-up is incredible and includes some of the world’s most successful coaches! During the live Pre-Summit event held in May until 11th June, you have the opportunity to join more than 45 high value sessions at absolutely no cost. After each presentation,you have the possibility to share your experience, thougts in a private virtual room with your peers. Shoud you want to go deeper in these sessions and/or to get more tools, you also have the possibility to register for the full summit starting June 15th. Early bird until June 9th. I am confident that you are going to get outstanding value from the FREE Pre-Summit event and from the Summit as well! Join me in this event and have fun while learning ! Committed to your Success ! Expert in Business and Executive coaching specialised in transformational & authentic leadership to help you grow your business, yourself and team.